As I mentioned back in June, I wanted to go take shots of the grain elevators at Sintaluta, Saskatchewan. While staying in Regina at the beginning of August, I had a chance to go do just that. I headed out of Regina near sunrise on August 1 in search of grain elevators. I drove past Balgonie, McLean, Qu'Appelle, and Indian Head and arrived at Sintaluta. There are two elevators in Sintaluta, one former Pool elevator and one former National elevator. Here's the National one, now displaying signs for "Sintaluta Seed Cleaning" and "Whispering Pine Farms". It evolved into quite a complex of buildings and tanks. The word National is showing through on this trackside view. The other elevator in town is a former Saskatchewan Pool elevator. Anyone know what the leaf / star logo is at the top of the elevator? The logo at the top of the elevator commemorates the 1967 Centennial celebrations. The elevator at Kronau, SK also has this. The rest of Sintaluta is pretty depressing. It is a textbook example of a formerly bustling Prairie town that has fallen into decay. Very sad. I started back toward Regina with the intent of shooting along the way. As I approached Indian Head, I saw a train pulling out of the town. I pulled over to grab a few shots of CP 8603 East in charge of an intermodal train. You can see the modern inland terminal in the background on the left. I shot the Indian Head elevators again, then continued on to Qu'Appelle. There is no elevator in Qu'Appelle, but there is a seed handling facility there, Seedtec-Terramax. From the looks of the track, and the stored flatcars on it, they don't use rail service. There was one more elevator to shoot, the massive concrete Pioneer inland terminal here between Balgonie and MacLean. I didn't have time to shoot the Viterra elevator at Balgonie... next time. On my way into Regina I saw a grain train waiting to go east at Kearney, so I did a quick detour to shoot CP 9683 and 3030 as they patiently waited. I was bored Saturday afternoon, so the kids and I went out to do a bit of shopping and to see some trains. The weather was somewhat rainy but that didn't deter me. First we went to Symington Yard. As I crossed the southern tip on Fermor, I saw a train approaching the yard from the Sprague subdivision. A quick trip down Symington Road by Grand Prix Amusements brought me to the tracks. CN 7522 and 7521 were working the hump yard to my right. SD60F CN 5532 was the sole power on the grain train coming off the Sprague subdivision. I took video with my Canon T1i but I had the long lens on... you can really see the lack of image stabilization in this video. We headed up to see what was going on with CEMR and CP in Transcona. CEMR was quiet, with 4010, 4013, and 5232 all stored behind the shops and the Brandt unit in front with some other power. I drove around a bit and found CP 9142 East stopped just west of Redonda Street, under the Perimeter Highway. After a few minutes, they started up and rolled into Winnipeg. CP 9103 was the second unit. At this point the rain broke. A beautiful rainbow came out. In fact, it was a partial double rainbow. I mean, it was no double rainbow, all the way but it was still pretty. After 9142 West passed, a local with CP 3065 and venerable GP9u CP 8251 rolled up with a transfer train. They pulled almost all the way through the crossing, then backed up into the CP Transcona Yard. Here's the video of their backup move. That was enough for the kids, so we headed home. I have a Blackberry Curve 8330 . It has video capability and I have been curious what quality of video it takes. Given the tiny plastic lens, I did not expect much. On August 13 I was getting some groceries at the Chaplin "grocery store" when I heard a train coming. I ran to the tracks, but all I had was my cellphone, so I shot video with that. You be the judge. Here's another one on the same day. Now that I have seen the video, I don't think I would even bother trying to use it! I woke up fairly early on August 12. I hit the road, heading west from Chaplin Saskatchewan to photograph the grain elevators in Morse and Herbert, and especially the GM lease unit at the Reed Lake inland terminal. The first town west of Chaplin is tiny Ernfold, and there was a westbound potash train in the siding. Just as I stopped, an eastbound freight rumbled past. This train had CP 8621, CP 9509, and CP 8564. After shooting CP 9584 at the tail end of the potash train, I drove up toward the head end. While I did this, another eastbound rolled past the stopped potash train. I missed the head end! I settled for a few shots of CP 9588 and 9675 at the head end while the grain train went by. Once the grain train passed, CP 9588 West turned their headlights on and prepared to roll out. I hit the road and set up at the next town, Morse, to await their arrival. Once the train passed, I continued on to Herbert to shoot the elevator and train museum there. I'll talk about the train museum later. I headed back toward Chaplin. As I passed Morse, I saw a westbound container train in the distance. I did a quick turn and headed back to Morse to get the train with the grain elevators. CP 8738 and 8711, both GEVO units, provided the power. I recall it was raining fairly steadily, so I shot from under the van's tailgate. Lest I forget, I should post a photo of the main reason I went out, GATX lease unit GMTX 410 at the Reed Lake inland terminal. The terminal is between Morse and Herbert. GMTX is a former Conrail GP15-1 (ex CR 1674). It appears to be a recent arrival at Reed Lake, since it was shot at other locations in 2008 and before. The Reed Lake elevator itself was completed in 2001. It appears to have rendered obsolete the elevators in nearby Morse and Herbert. Here are some more Saskatchewan grain elevator photos. Dave Dineen has a great blog post and video about a recent container transfer he saw. You really need to watch the video for the surprise at the end of the first clip. After my Morant's Curve adventure, I decided to get up early in the morning of August 8 to shoot the Rocky Mountaineer as it made a stop in Banff. The Rocky Mountaineer was due to pick up passengers at 8:20 AM. I didn't think I had enough time to run out to Morant's Curve afterward and still be back at my campsite by 10, so I elected to stay near Banff to get the shots. I got up at 5 AM, showered, then hit the road to Banff East to wait for the westbound Rocky Mountaineer. I knew that was too early but better early than miss the shot! At 6:05 AM a westbound potash train came rolling past with an abundance of power. CP "toasters" (AC4400 engines) 9764 and 9720 were on the head end, with CP 9767 in the middle and CP 8602 bringing up the rear. I brightened this shot quite a bit. Those unit trains of Canpotex cars were getting familiar by now. I heard they were to proceed to the siding at Massive to wait for an eastbound. Since I wasn't going to get the Rocky Mountaineer at Morant's Curve, I needed to look for a spot to shoot them west of Banff. I did a little driving on highway 1A and found a spot I liked. I then decided to find Massive and sure enough, I did find it. It's a little ways off the highway but accessible via a trail. As I parked my car and prepared to walk down the trail, I heard the eastbound train they were meeting. I sprinted down the trail only to find that the waiting train was blocking the shot! :P I did a quick grab shot of CP 9767 then ran back uphill to my car. 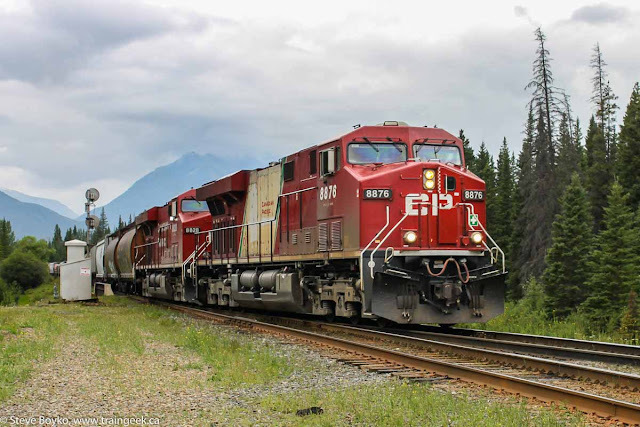 I beat them to the 1A / Trans-Canada Highway ramp and pulled over to shoot the train there. I pointed my camera and... the flash popped up. Much cursing ensued. My camera decided the light was too low and, even in Sports mode, decided to try a flash. The train flashed by and I jumped back into the car and gave pursuit. I finally caught up with them at Banff East and shot them at 07:20. The train was an intermodal eastbound with CP 9559 and CP 9500 leading, and CP 9575 mid-train. This was shot from the shoulder of the highway. I checked in at the Banff station and there was no sign of the Rocky Mountaineer yet. I hadn't heard them clear Canmore so I knew they were nowhere near Banff. In the meantime, I caught CP 8858 East at Banff East at 08:20. This was a big intermodal with 8858 and CP 9722 on the head end, CP 8844 and CP 9827 spread singly in the train, and finally CP 8749 pushing on the rear. Still no Rocky Mountaineer! What was going on? I understand that ex-VIA LRC engine 6917 has been saved - congratulations to the dedicated group of people for raising the funds to save this engine. Now they are looking for funding to move it to the Toronto Railway Heritage Centre. Shooting moving trains in low light is difficult. If they weren't moving, you could put the camera on a tripod and use a long shutter speed to good effect. However, their motion demands a fairly quick shutter speed to capture the train without blurring. The only other option is to use a bank of lights, such as O. Winston Link used to use and Gary Knapp does now, but for most of us that is not an option. I shot a very long eastbound intermodal train at Eldon siding near Banff, Alberta on August 7. This train had CEFX 1041 and a CP unit leading (CP 9467 I believe), then CEFX 1033 a ways down, then CP 9516 down farther, then CP 9553 near the end of the train. Three separate DPU units! I shot it at 6:20 AM, before sunrise, in the woods, so there was not much light available. Here are the different units and the techniques I used to try to get some kind of usable photo. Here's the head end, shot with default settings (F/3.5, 1/25s, ISO 3200). As you can see, it is impossible to read the unit number. The shutter speed was too slow. For the next unit, CEFX 1033, I elected to pan the train and see if that would bring some portion of it into focus. I think it worked out OK for the unit number (F/5.6, 1/40s, ISO 1600). I tried basically the same technique with CP 9516. The results weren't quite as good but they were OK (F/5.6, 1/32s, ISO 1600). After that, I overrode the shutter speed to see what that would do. The picture was fairly sharp but very very dark. I did a lot of processing on this photo to get it to this state (F/3.5, 1/250s, ISO 1600). Clearly selecting a lower shutter speed and panning produces better results. Why was I at Eldon siding in Alberta? Those who follow me on Twitter know I was heading to Morant's Curve. More about that later.